Independence. Starting all required external dependencies on the developer’s local machine is extremely powerful. You don’t depend on a dedicated (and maybe error-prone) infrastructure and don’t interfere with other developers. Getting started immediately. Using Docker and Docker-Compose, we just have to call docker-compose up and all dependencies are available and wired correctly together. … seeding the database with nice and varying fake data. … each external service that your application requires. That can either be a handwritten stub or the actual service wrapped in a Docker container. Dynamically typed languages like Python are really handy to write seeding scripts or service stubs. Faker libraries are very convenient to generate dummy data. Your application or the whole system don’t have to run with Docker in production to benefit from this approach. Mind, that this approach is about easing local development and ad-hoc testing during development; not about automated (integration) testing. The complete source code can be found in my repository ‘smooth-local-dev-docker’ on GitHub. The complete docker-compose.yml can be found here. We’ll cover the relevant parts in the following sections. Hint: The Pipfile and Pipfile.lock declare the dependencies of the corresponding Python scripts and are installed in the Dockerfile. Calling docker-compose up will start up a MongoDB and a MySQL container. Check out the documentation on DockerHub for additional configuration options via environment variables or mount points. UI development. We can click through the UI of our application and see meaningful and varying data. (HTTP/REST) API development. We can fire some ad-hoc HTTP calls via curl/httpie/Postman/our browser and get responses with reasonable data from our application. So getting started with development becomes much easier. And everything is local! But how do we seed our database? Some database images allow mounting scripts into the container which are executed on startup. However, this approach might be not flexible enough since it often only supports static files. Writing and maintaining them is cumbersome. Write a small script that generates randomized and varying data and writes it to the database. We wrap this script into an own Docker image in order to execute them automatically via docker-compose. I love to use Python for this. But every dynamically typed language is fine. Moreover, check out the library Faker to generate nice dummy data like words, sentences, addresses, names etc. Those faker libraries exist in nearly every language. Let’s take a look at a seeding script for a MongoDB. The complete source code for seed-mongo.py can be found on GitHub. Add the following service to the docker-compose.yml. The depends_on ensures that the seeding script/container is executed after the mongo is ready. "address": "5243 Kennedy Island\nAguilarshire, NE 86427"
Important Hint: After changing the seeding script, use docker-compose up --build to re-create the image with the seeding script. Otherwise, your change will have no effect. The stubbing approach works pretty well if we only consume a couple of resources and if there is no sophisticated interaction and state between our application and the external service. If things are getting more complicated, you may end up re-writing the external service. In this case, it’s better to use the real service. Pro: No need to write a stub. Using the real service makes your setup more realistic. Cons: You need to provide every dependency that is required by the external service. This, in turn, can be databases (which has to be seeded) and other services. This might end up in a huge effort and is not justified in every case. But let’s take a look at the implementation. The good news is, that the external service doesn’t have to be dockerized in the first place. Wrapping it manually is easy. Just curl the jar from our internal Maven Repository (like Nexus or Artifactory). The config.yml contains configurations like the coordinates of the database for the external service. Its database will also be started by docker-compose. # the host is the service name in the docker-compose.yml. Light-weight. Docker is an approach for light-weight virtualization and comes with a small overhead and footprint. It’s no problem to start multiple Docker container at the same time on a single machine. No pollution. We don’t have to install the databases and services directly on the developer’s machine. After stopping the containers, no remainings are left on the filesystem. Automation. 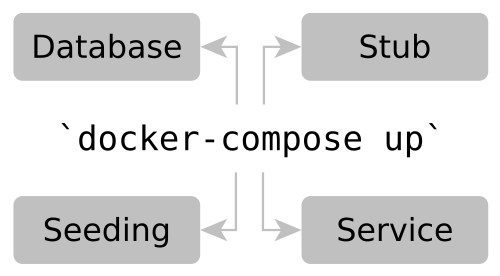 Docker-Compose allows automating the creation of the whole development environment. We only have to call docker-compose up. Full control over data and responses. It’s easy to reproduce certain scenarios locally (like null values or broken data). Learning Python is easy, great fun and worthwhile for every Java Developer. I recommend the book Python for the Busy Java Developer . Let the seeding scripts reflect the variety of data in the production database. If a certain field can be null, also return null in 25% of the cases (using faker.boolean(chance_of_getting_true=25)). Mind to use docker-compose up --build after changes in the stubs and seeding scripts. So the Docker image with the updated scripts is rebuilt. Otherwise, the changes don’t take effect. Speed up the re-creation of the Docker images by putting the lines that change rarely to the top (RUN pip install pipenv) and the one that changes more frequently (COPY external-service-stub.py /) to the bottom. This way, only the last layer of the image needs to be recreated after the script has been changed. This also enables the reuse of certain layers across all Docker images (e.g. every Docker image starts with RUN pip install pipenv).